They're leading some of the biggest tech companies, but they're also helping fund tech's next big thing. 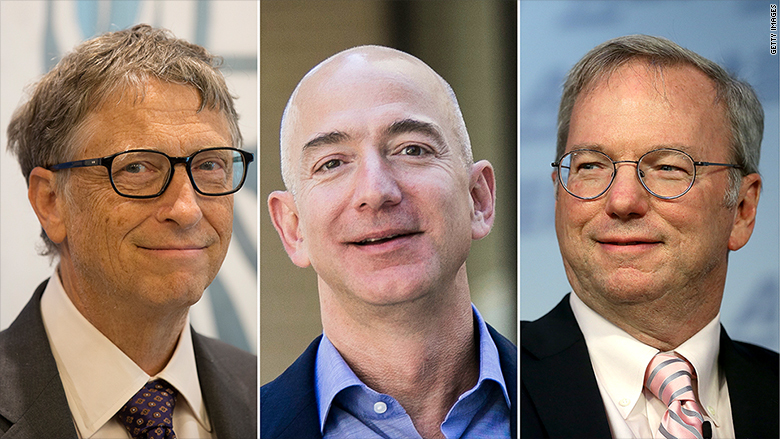 Google's Eric Schmidt, Amazon's Jeff Bezos and Microsoft's Bill Gates top the list of powerful tech executives who double as active angel investors. That's according to The Information's Insider List, published on Thursday. Together, Schmidt, Bezos and Gates have invested in more than 104 companies. The exact number of investments -- and their amounts -- is unknown, given that many private investment deals go unreported. "The picture that emerges is of a rarefied group of powerful executives who have their fingers in a multitude of pies," writes the The Information, a subscription-based tech news site. The report notes that while there are other angel investors who are more active, these executives' investments are a window into their passions and where they're betting the future of tech is headed. Here's a peek at the types of companies these insiders have recently funded. Eric Schmidt: The executive chairman at Alphabet, Google's parent company, is investing in a range of sectors, from big data to on-demand services to health tech. --Periscope Data, which is helping data scientists build custom detailed visualizations. --On-demand startups Blade and Roadie. Blade is a chopper logistics company that's often referred to as the "Uber for helicopters." Roadie, on the other hand, is tackling shipping logistics. Dubbed the neighbor-to-neighbor shipping network, it utilizes empty space in cars, thus cutting down on traditional shipping costs. --Doctor on Demand. Cofounded by Dr. Phil, it offers online video consultations with thousands of credentialed physicians and therapists around the country. Jeff Bezos: The president and CEO of Amazon (AMZN) has invested in a wide variety of nascent startups, and was also an early investor in more well-known companies like Uber, Airbnb and Twitter (TWTR). --Convoy, which helps truck owners find, price and book shipping jobs. --Fundbox, which advances payments for outstanding invoices, so contract workers (think carpenters, plumbers, freelancers) can avoid cash flow issues. --General Fusion, which is developing technology to create clean energy from nuclear fusion. Bill Gates: The founder and director of Microsoft (MSFT) has backed various biotech, medical and social impact companies. --Impossible Foods, which uses molecular technology to create meat and dairy alternatives from plants and grains. --Nimbus Therapeutics, a biotech firm that is developing breakthrough medicines for diseases like cancer and immune disorders. --Change.org, which is an online petition platform used to mobilize support for social causes. Other active tech execs on the list include Facebook's (FB) Mark Zuckerberg, a backer of AltSchool, and Google's Sergey Brin, an investor in 23andMe and Tesla Motors (TSLA).